Made from premium quality, medium weight waxed cotton, the Hoggs of Fife Padded Waxed Waistcoat is hard wearing and very comfortable for everyday use. A quilted polyester tartan lining offers added warmth and comfort and the corduroy collar creates a classic country look. 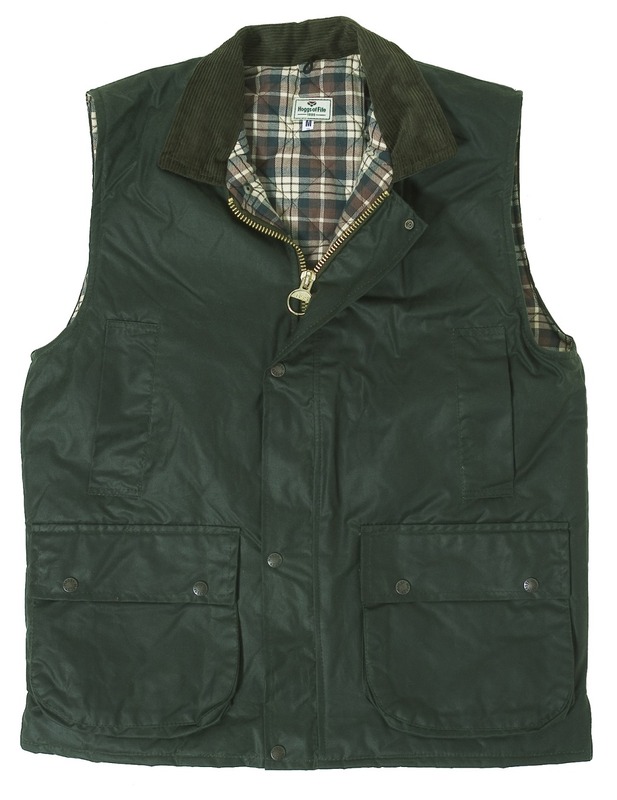 This great value men's country waistcoat features a two-way front zip with a studded storm flap to keep the elements out. Other features include two patch front cargo pockets, two handwarmer pockets and an inside pocket. Please note that no waxed cotton garments can claim to be completely waterproof unless a waterproof membrane has been fitted between the outer layer and the lining. All the seams also need to be carefully taped on the underside. Hoggs of Fife currently know of no such example currently available in the UK. In order to protect your Hoggs of Fife waxed waistcoat and maintain a high standard of water resistance, it is important to reproof the waxed cotton outer regularly. We recommend the use of Hoggs Professional Dressing for Waxed Cotton Clothing.